Free delivery $95 and over! 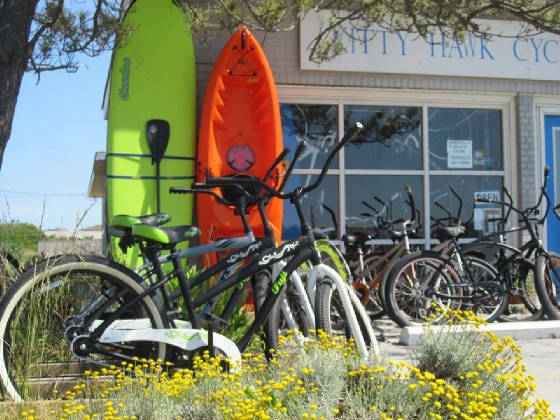 - We offer weekly delivery to Corolla, Pine Island, Duck,Southern Shores, Kitty Hawk, Kill Devil Hills, Nags Head, and Manteo. ( Sorry- no 4x4 or Hatteras delivery). - We do not offer daily rentals or instore pick up. These options are available at our sister store Duck Cycle. - All pre booked orders are delivered on your check in day, and picked up on check out day, unless otherwise specified. Late orders are accepted, however, depending on the time that they are received, we may not be able to deliver on your check in day ( we will do our best! ) and we may need to deliver them on the following day. - All bikes come with a combination lock. 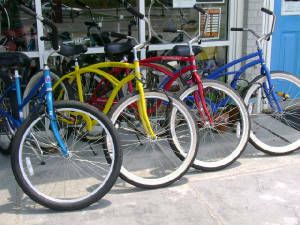 Kids bikes ( 16" and 20") and child accessory bikes include childs helmets- 1 helmet per child. - NC law states children under 16 must wear a helmet. If your child is under 16 and riding a larger rental bike, a helmet may be provided upon request. - Online check out info: We offer check out through PayPal. We do not process your credit card information online. A PayPal account is not necessary. You may also place a phone order with a Visa or Master Card.